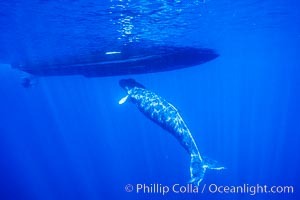 Humpback whale, abandoned calf alongside University of Hawaii research boat. This young calf lived only a few days after being abandoned or separated from its mother, and was eventually attacked by tiger sharks. Abandoned Whale Calf Photo. 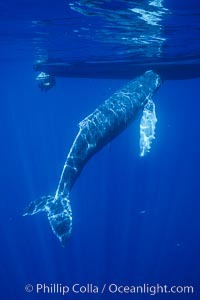 Humpback whale, abandoned calf alongside Hawaii Whale Research Foundation research boat. This young calf lived only a few days after being abandoned or separated from its mother, and was eventually attacked by tiger sharks. Abandoned Whale Calf Picture. Humpback whale, abandoned calf alongside Hawaii Whale Research Foundation research boat. This young calf lived only a few days after being abandoned or separated from its mother, and was eventually attacked by tiger sharks. Stock Photography of Abandoned Whale Calf. 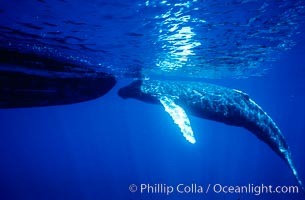 Humpback whale, abandoned calf alongside Hawaii Whale Research Foundation research boat. This young calf lived only a few days after being abandoned or separated from its mother, and was eventually attacked by tiger sharks. 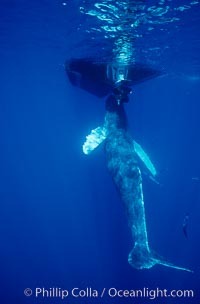 Photograph of Abandoned Whale Calf. Humpback whale, abandoned calf alongside UH research boat, UH research diver visible. 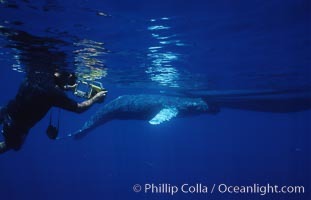 Abandoned Whale Calf Photos.